What’s wrong with “strong” female characters? What can we do to fix the Hugo awards? What determines a dystopian society’s dress code? Can a video game affirm our humanity? The Internet has the answers. Speculative Fiction 2013 collects over fifty pieces from all corners of speculative fiction fandom – from book criticism to incisive commentary on important issues like sexual harassment at conventions; from feminist themes in summer blockbusters to life-changing video games; from the merits of grittiness to the downfalls of grimdark. 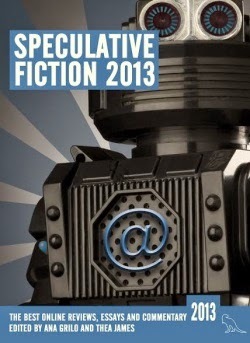 All profits from sales of Speculative Fiction 2013 will be donated to Room to Read.